Davey Todd on the Penz13 BMW at the Macau Grand Prix. Rising star Davey Todd will spearhead a three-rider line-up for the Penz13 BMW Motorrad team at the fonaCAB North West 200 in association with Nicholl Oils in May. Rico Penzkofer’s German outfit last competed at the international road race three years ago but will be back with a bang at the 90th anniversary meeting, which takes place from May 14-18. Daley Mathison will return to the North West 200 on the Penz13 BMW in May after missing the event in 2018. Last year’s fastest newcomer Todd will be joined by Daley Mathison and Finland’s Erno Kostamo, who will be making his debut around the 8.9-mile Triangle course. The trio will ride BMW S1000RR machinery in the Superbike and Superstock races. However, Danny Webb – the team’s other regular rider – misses out as the event clashes with a round of the Endurance World Championship at the Slovakia Ring. Todd, who is taking on a new challenge in 2019 after making a name for himself with a string of standout results with the Burrows Racing team last season, said he hoped to reduce the deficit to the frontrunners as he makes only his second North West 200 appearance. The Saltburn-by-the-Sea rider sealed a brace of 12th and 13th place results in the Superbike and Superstock races last year and Todd is confident he can climb the leader-board in May. “I am very excited to return to the North West after being the fastest newcomer last year,” Todd said. “I aim to continue closing the gap to the regular frontrunners. Todd’s performances last season earned him a number of options with many of the top teams for 2019 but after riding for Penz at the Macau Grand Prix last November, he decided to stick with the outfit for the year ahead. In addition to the major international road races, the 23-year-old will also contest the International Road Racing Championship in Europe. Team boss and former NW200 competitor Penzkofer said: “We have pulled together a strong line-up with Erno, Daley and Davey. 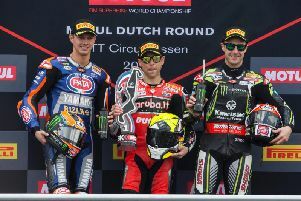 “It will be a very challenging task with half of the team at Hengelo and the other half in Slovakia just two days before the first North West practice session. Mathison, from Stockton-on-Tees in County Durham, was absent from the North West last year but has now set his sights on breaking into the top ten. “After missing the 2018 event, I am excited to get back to the North West,” he said. NW200 Event Director Mervyn Whyte said the Penz team had established a reputation as a proven force at the international road races and the Endurance World Championship. “Rico and his team have proven they can run with and beat the best in international road racing and world endurance competition,” he said. The official launch of the 2019 North West 200 will take place at the Lodge Hotel in Coleraine on February 28 with the annual ‘Meet the Riders’ night. A host of top names will be in attendance, including Glenn Irwin, Alastair Seeley, Ian Hutchinson, Lee Johnston, Adam McLean, Dean Harrison, Jeremy McWilliams and newcomer Richard Cooper. Admission is free but is strictly by ticket only. To apply, visit www.northwest200.org/meet-the-stars.